Note: This painting was reproduce as a Christmas card by the Royal Academy of Arts. MARY FEDDEN. ROBIN WITH FEATHER. Birds is a common theme in Mary Fedden’s paintings. They feature over and again, whether incidental or as the main focal point of a work. In 1999, Mary Fedden published Birds, a little book showcasing a wonderful collection of original watercolours inspired by one of her favourite subjects. In the foreword to the book, Mel Gooding, author and critic, writes “Mary Fedden’s birds are not the birds of the guide book and handbook, schematically delineated for use in the identification, or those of the great ornithological albums, such as those of Audubon, Gould or Thorburn, whose subjects are described with the definitive accuracy of scientist and the grace of the gifted enthusiast. They are the birds of her life, casually seen and enjoyed in gardens and parks, encountered with joy on a holiday walk by the sea, glimpsed from a window on the familiar river and its muddy banks, or found with unabashed pleasure in guidebooks or albums. They are, in the true sense of the word, appropriated: that is to say, taken out of nature and of art, and made her own. 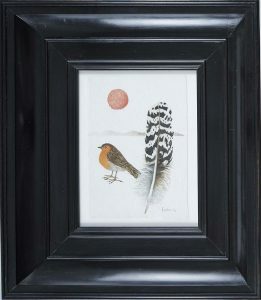 This lovely painting, Robin with Feather, is painted in gouache on handmade paper. 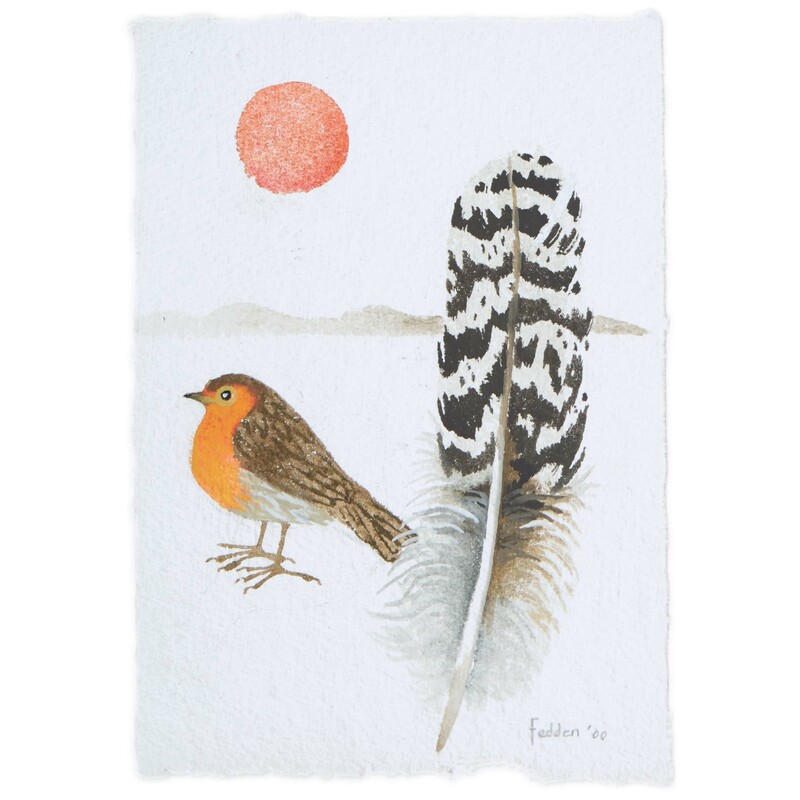 The richly-coloured setting sun, bird feather and the robin redbreast combine to make a great example of Mary Fedden’s bird paintings. This picture was chosen by the Royal Academy of Arts as one of their series of Royal Acedemy Christmas cards, making it one of her most recognised works. This is your chance to own the original! MARY FEDDEN. ROBIN WITH FEATHER. Sorry, this painting is sold.